The rock group Queen have long been considered one of the greatest of all time, with their unusually complex, dramatic and memorable ‘Bohemian Rhapsody’ almost never outside the top three when it comes to lists of the best songs ever written. It illustrates not just how original and accomplished they were as musicians and studio technicians, but also how easily they could change their style. When stadium rock anthems didn’t exist, they invented them and rocked us. When punk came out in the seventies, they gave us a sheer heart attack. When nightclubs needed a new floor-filler in the eighties, another one bit the dust. And when someone was needed to bring the whole world together at Live Aid in July 1985, they were acknowledged as the champions of the world. Through it all they never seemed fazed by change; they either made it or were shaped by it, but they never shrank from it. The world always changes, but it seems to me that the pace of it has always had either the semblance of method about it or progress underpinning it. Whether it was Space being conquered, the Cold War ending or the Internet starting, the tides of macro environmental change have always moved gently forward. But now, if you’ll excuse the maritime metaphor, the sea is far choppier, the undercurrents more unpredictable and, fearing a storm, we seem to be yearning for the nearest safe haven, the easiest to reach being a port called Nostalgia. Brexit negotiations are quite naturally going to be long, difficult and frustrating for everyone concerned, and the political and economic realities are a long way from being clear for anyone. If that weren’t enough, the protagonists in favour of it are still trying to decide what Brexit actually means by taking potshots at each other in the national press more than six months after Article 50 was triggered, and this creates further instability when certainty is arguably more needed than at any other time in recent history. Unsurprisingly there is now a void, but rather than with urgency and action it is being filled with jingoistic posturing and political dissembling. Churchill was evidently right about democracy. In early July I was following traffic into Hereford, where I found myself stuck behind a septuagenarian couple in a motorhome decorated with the following on its rear in unavoidably large letters: English and very proud!! And then below in brackets: You needed us in 1945 Juncker – have you forgotten? First I felt annoyed at how some people manage to feel proud of their nationality, rather than grateful, as though it is something that they achieved through hard work and not just the luck of the draw. Then I tired of my sanctimoniousness and considered honking my horn, winding down my window and shouting “Hey dude! I’m an American and very proud. I seem to recall that y’all needed us in 1945 too – have you forgotten?” Luckily I remembered that I am no longer American, had never been proud of it anyway, and so thought better of my childish idea before silently wishing them on their way and out of mine. Towards the end of August, an English couple in their sixties couple rang our doorbell to buy some of the concrete homeware that my wife sells from her roadside stall. During the conversation she apologised for the slightly messy state of the display by explaining that we had just returned from holiday. “Oh, anywhere nice?” they politely asked. “Yes, Italy”, we said. “Oh lovely. Except for the Italians!” came the reply. Normally I let comments like this go, because, you know, there’s no point. But then I thought no, not in my house. “I’m Italian.” I said matter-of-factly. His reply was first to gloat “Ah, that’ll be why you’ve moved here then!” which elicited from me a rather fixed and no less blank stare. Utterly unfazed, he then added “Oh, you’re probably Northern Italian then; that’s quite different.” I’m not exactly sure what mystified me more; his total lack of embarrassment for making such an idiotic comment in the first place or that he felt drawing a line between the Tyrrhenian Sea and the Adriatic would justify it. 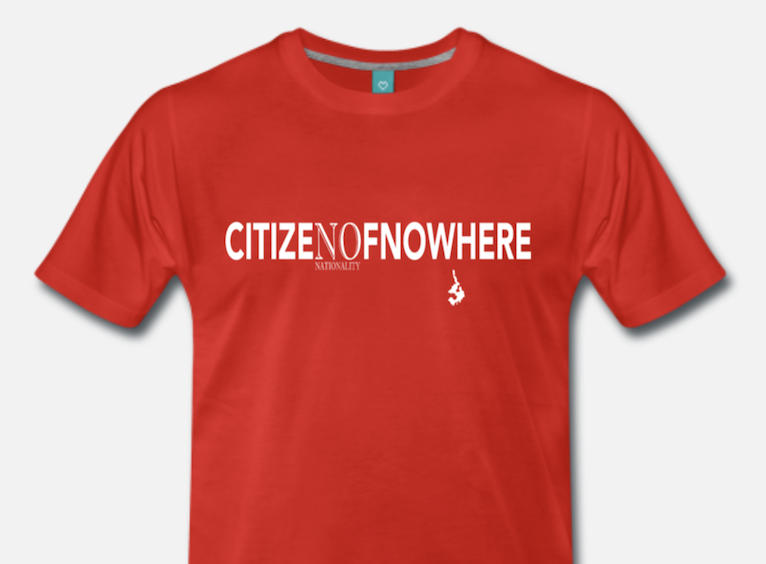 In October 2016 during a speech in Birmingham, Theresa May stated that anyone who considered themselves a ‘Citizen of the World’ was actually a citizen of nowhere. As a vacuous and irritatingly catchy soundbite, it rather reminded me of Joe Dolce, but, I imagine, would have resonated strongly with both couples mentioned above. I also noted that it wasn’t without precedent, as drawing lines on maps of other countries is something which British politicians have long considered an effective way of governing. Unfortunately though, the problem with characterising Identity by what it isn’t, apart from being silly, is that it’s no more effective than defining a goal by knowing what you don’t want, and that has been the story of Brexit so far. Rather than allowing myself to be exiled to the land of Nowhere to satisfy somebody else’s whim, I choose to consider myself a citizen of Now Here, perhaps Then There and, who knows, maybe Somewhere Else Later. This post was inspired by a friend’s T-shirt which is emblazoned with the phrase “No Nationality.” I’ve copied it, combined it with Theresa May’s rather nihilistic comment and exercised my right to partition the letters where I want in order to create a new item of branded clothing that speaks for me.